You don’t have to wait for—or even believe in—Easter to enjoy playing 12BET’s “Easter Surprise”. 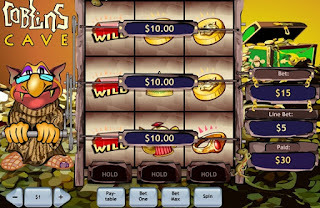 In fact, this online slot game offers you at least three ways to do three things: win, win, and win. Place your bet, spin the five reels, and wait for at least two scatter symbols to appear in the spin results. When this happens, your payout earned will be multiplied by your total bet and added to your current winnings. If three or more scatter symbols appear, you’ll win 10 free games, plus a chance to triple all your winnings during those free games, except for Easter Gifts Bonus. Assuming that you win in every free game, your winnings will be multiplied by an astounding 59,049 (3 raised to the power of 10)! You’ll unlock this Bonus only if three or more Bonus symbols appear consecutively in an active pay line. Here, you pick 3, 4, or 5 out of 6 eggs (depending on the number of unlocked Bonus symbols) to win cash prizes. Lucky for you, the winnings per egg are accumulated. Another feature that can spice up your gaming experience is the “Gamble” button, which allows you to double your winnings from your last spin. All you have to do is guess whether the next card that shows up will be black or red. Every time you win, you can bet until you’ve reached the Gamble feature limit. Scatter wins, Easter Gifts Bonus, or Gamble. Take your pick. 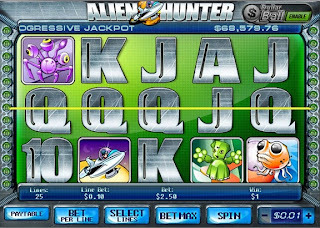 Alien Hunter is a slot game, skill game, and lotto all rolled into one. You have at least three ways to win big in this: the bonus rounds, the lotto-like side game, and the free spins from unlocking scatter symbols. Alien Hunter offers not one, but two, bonus rounds. The first one, known as the collecting bonus round, is unlocked by obtaining egg bonus symbols on the first and last reels. For this round, you have to click alien eggs that contain win multipliers. Be careful what you click, though; one egg contains the “headjumper” alien, and if you release it, the bonus round is over. The second round, called the hunting bonus round, is unlocked when you obtain three spaceman bonus symbols on an active payline. You might find this round more fun than the previous one, as you must catch 6 aliens within 10 seconds. The types of aliens you catch determine your final win. Don’t worry if you don’t win anything; you get a consolation prize nonetheless. This is the lotto-like game we were talking about earlier. Here, you simply pick 5 numbers out of 49, and wait for 5 numbers to be drawn randomly. The more your selection matches the drawn numbers, the higher your win. If all five numbers match, the jackpot is yours. Get at least three scatter symbols in Alien Hunter, and have free spins. The number of free spins is determined by the pay table for the scatters. All your winnings from these spins will be calculated from the basic payout. If there’s an all-in-one slot game, Alien Hunter would be it. Why not give it a try today? Do you have a knack for predicting keno numbers with an almost supernatural accuracy? 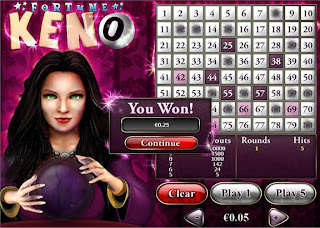 You can put your skills to the test with Fortune Keno. All you have to do is pick two to ten numbers from the number grid. You can de-select a number by clicking it again, or click “Clear” to de-select all. Once you’re satisfied with your selection, make your bet at the bottom of the screen using – or +. Press “Play 1” to play one round, or “Play 5” for five rounds. For each round, 20 numbers will be drawn. If you win, a pop-up will appear in the middle of your screen indicating exactly how much you’ve won. Your winnings depend on how many numbers you chose, and how many correct guesses you made. To know exactly how much you’ve won, refer to the pay table underneath the number grid. Here, you’ll see the number of rounds you’ve played, the number of hits/accurate guesses you have, and the pay-out multiplier corresponding to your hits. “Fortune Keno” looks like a simple game, but it’s definitely not something you should take for granted, considering the potential size of the payout. Also, as you know, predicting numbers isn’t a walk in the park, so this game provides enough challenges to keep you interested. 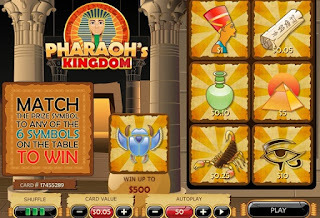 Raid a pharaoh’s kingdom a la Indiana Jones—minus the curses, traps, and bad guys trying to kill you—through 12BET’s scratch game “Pharaoh’s Kingdom”, in the comfort of your home! You don’t need archaeological knowledge to win this game; just the blessing of Lady Luck. All you have to do is purchase up to three cards by clicking “Play”, shuffle these cards as you wish, and scratch your card at hand to reveal six symbols. If at least one of these symbols matches the lone card located at the center of the game, you win the prize corresponding to the symbol. You don’t have to look up a pay table, because the values corresponding to the symbols are already clearly indicated. The higher the value you’re willing to pay for the cards and/or the more cards you buy, the more chances you have of finding the pharaoh’s treasure! Even the most powerful pharaoh’s treasure has limits. “Pharaoh’s Kingdom”, on the other hand, offers you unlimited opportunities to make money beyond your wildest dreams, without breaking a sweat. Here in 12BET Casino, our goblins are different. You don’t have to fight them to find your treasure; in fact, they’re more than happy to help you win that coveted jackpot! In “Goblin’s Cave”, click the – or + buttons at the bottom left corner of the screen to make your bet, then click ‘Spin’ to start gameplay. Initially, only the bottom row will spin. You can hold one or more reels using the “Hold” buttons below the slot machine. If you click ‘Spin’ again, two more rows will spin and determine how much you’ll take home as winnings. Since the machine has three rows, your chances of winning are likewise multiplied by three. For instance, in the screenshot, the value of each coin is $1. Clicking ‘Bet Max’ will multiply the number of coins by five; therefore, your line bet is $5, and your total bet is thrice that ($15). Your winnings per line are calculated according to a pay table, which you can access using the ‘Pay-table’ button. In case you think this is an ordinary “Spin until you win” slot game, get this: “Goblin’s Cave” has an unlockable bonus game. You can get this only if you get three lantern symbols in a row. Get two rows of three lantern symbols, and you’ll also get two bonus rounds. Get three rows of three lantern symbols, and … well, you get the idea. You’ll see a chest in the bonus games, which you can click to win prizes! Start your hunt for treasure with your friendly bespectacled goblin today! 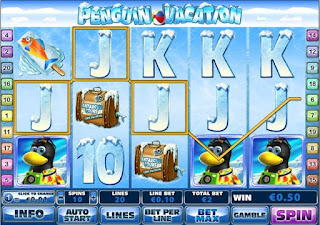 It is through the slot game, Penguin Vacation that a player gets up to thirty-three (33) free spins and a win multiplier, which generates pries that are 15X bigger than the original bet. Triggering the free spins is easy. A player automatically enters the fishing bonus round whenever three (3) or more scatters appear on the reel. 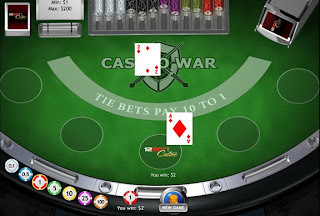 Initially, one receives eight (8) freebies and doubled wins. However, if three (3) or more scatters appear again during the said bonus round, fifteen (15) more spins shall be awarded to the player. Since the freebies can be triggered indefinitely, a player can get more freebies as the game continues. Another major feature of Penguin Vacation is its wild symbol. Not only does it substitute or replace another symbol, it is also stacked. Stacked symbols can generate more wins since they can cover an entire reel. Aside from that, it also doubles the prize whenever it forms a winning combination. Also, if there are five (5) or more wilds on the reel, the award is multiplied by 10,000! On the other hand, for a player to maximize the game, it is best to place bigger bets. A $2 wager multiplied by 5, for example, will only amount to a $10 reward. However, a player who wagers $20 and gets the same multiplier, shall have $100. Obviously, the latter’s prize is ten (10) times bigger than the previous member. Both players won, but the other scored bigger. For members who want to score big in slots, there is no doubt that Penguin Vacation is a game to play. Lucky slot Indonesian player AriXXXX secured a life-changing $713,000 win while playing the 50-line version of Iron Man 2. AriXXXX is just one of 12BET Casino’s biggest winners. It can be remembered that a Malaysian player also won a huge amount in the casino site. The total winnings amounted to MYR 770,000. Yet, instead of Iron Man, the generous culprit is Everybody’s Jackpot. Several months after, another player from Thailand brought home more than THB300,000 just by playing Marvel Roulette and now AriXXXX shall be joining the casino’s long winner’s list. AriXXXX hit two (2) progressive jackpots—Ultimate Power (biggest pot) and the Extra Power. His bankroll grew to a jaw dropping amount not only because he nailed the highest money pool, but also because he won the extra power thrice. Within 48 hours, AriXXXX’s bankroll grew to $10,000. It is important to note that AriXXXX is not the first huge winner of the slot game, Iron Man. Last April, another player also hit a $42,000 worth of jackpot from the said game. There is no doubt that Iron Man is one of the hottest one-armed bandits that you can find online. With the series of big wins happening in 12BET Casino, it seems like Lady Luck prefers to stay longer in this place. Have your share of Lady Luck’s grace today. Play now and you might just have that winning streak! Playing online bingo doesn’t have to be boring. All you have to do is log on to 12BET’s website and look for “Beetle Bingo”. In this game, your aim is to get a winning five-number combination. Click “Play”, scratch the three rows of leaves, and reveal three rows of five-number combinations. You’ll see a group of 15 number-carrying, colorful beetles flying out from their little bottle and lining up one-by-one at the bottom of the screen. Each beetle corresponds to a winning number. If you get a winning five-number combination (like 8-38-73-23-11 in the screenshot above), you will get the corresponding prize. As you can see, the number 3 is a recurring theme in the game. 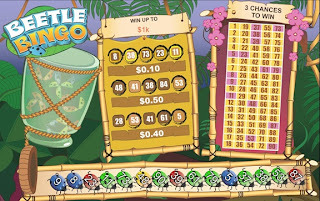 Beetle Bingo allows you to purchase up to three cards. That means you also have three chances of winning. (You can shuffle your three cards as you wish, so you’ll increase your chances of hitting the jackpot.) Even the interface is divided into three objects: the bottle containing the beetles, your current scratch card, and numbers from 1 to 90. Speaking of which, the game has a well-designed interface, and it’s not just because of the bright colors jumping out at you. You can keep track of everything at once without hurting your eyes: your bet, the cards you have on hand, your winnings, etc. It’s a long shot, but you could try getting a combination where all 15 beetles correspond to all 15 numbers on the card. You’ll win not only money, but also bragging rights to your fellow players! Another batch of high-paying games joined 12BET Casino’s spectacular game collection. The new roster of casino games is inspired by your very own childhood superheroes and memorable movies that make your playing time rewarding and satisfying. 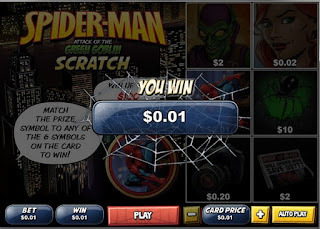 Spiderman gives you more reason to “go web” when playing casino games. This scratch card can multiply your winnings by 10,000X. On top of that, you only need two (2) identical symbols to form a match. The most celebrated X-Men character is now a scratch card. 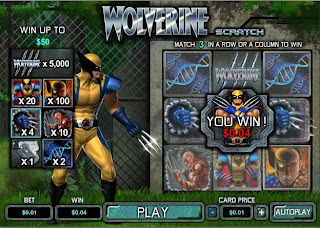 Use Wolverine’s claws to scratch your winning combinations that can go up to 5,000X higher than your original bet! Good news for Captain America scratch card fans, its online slot counterpart has also arrived in 12BET Casino. This game can give you up to 12 free games, which you can use according to your advantage. Similar to Captain America, you can also enjoy the slot version of the scratch game, The Avengers. 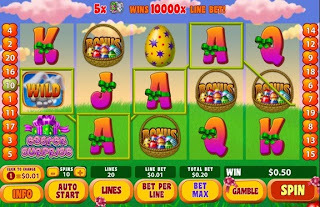 It features a progressive jackpot and not only that, you can readily exploit thirty-six (36) games into this slot machine. 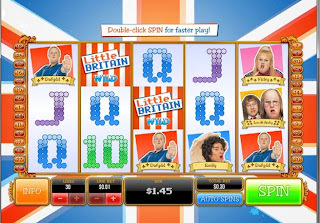 Adapted from a popular radio-turned into a television show, this online slot game can increase your bets by up to 100 and not to mention the fact that you can also get up to ten (10) free spins. 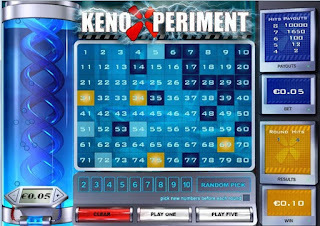 Adding more oomph to traditional keno, the casino game, Keno Xperiment adapts a scientific theme that seems to bring you in a laboratory of huge jackpots and cash prizes. Along with it is cool sound effects that seem to motivate you to play even more. Keno Xperiment’s is no different from other keno variant that you encounter. Only the game’s design and theme make it a cut above the rest. If you’re rooting for variety, you shouldn’t miss this one. For the benefit of new players, this game simply requires you to choose 2 to 10 numbers. The machine shall randomly pick a number from the board and if it matches your pick, you win. Yes, Keno is all about number matches. The game shows off a “random pick” feature. This means that the machine chooses the number for you. If you don’t fully trust your instincts when it comes to your number choices, such feature shall serve you well. But here’s a quick tip whenever you use this option: select number patterns which are evenly spread out on the board. Keno Xperiment has eighty (80) numbers to choose from. Therefore, you have to be strategic when placing your picks. Since the results are randomly selected, a well-spread number selection increases your winning possibilities. The game also contains the “play five” option. This enables you to play five (5) games consecutively. If you have other things to attend to, but can’t get enough of Keno, you can always use this option. Overall, Keno Xperiment is one of those games that beginners can take advantage of. Veteran players, who want to take a break from a tasking strategy creation, can also exploit this one. To some, the online slot game Bermuda Triangle may be a far-fetched attempt to attract classic slots players—considering the fact that one-armed bandits have readily evolved through time. Nevertheless, it brings nostalgia—back to the days when the simplicity of one-armed bandits is enough to take players into a climatic and ecstatic state. Bermuda Triangle lacks the common features that most players of this generation can think of. There are no scatters and wilds. Bonus rounds and free spins are also not present in the game. It leaves no other option for the players, but to rely purely on Lady Luck’s grace. 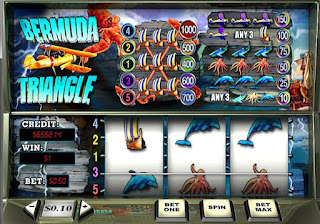 However, compared to other online slot games, Bermuda Triangle thrives through small bets. With a minimum of $0.25, anybody can already enjoy a spin and for those who want to go for the maximum, a $10 bet would do. Apparently, the game’s maximum wager is just the minimum in other online slots. Likewise, Bermuda Triangle brags its 1,000X jackpot, which is triggered whenever three (3) ships are formed diagonally in the 5th pay-line. Whilst some are not convinced by the game’s strong points, it cannot be denied that it is perfect for new players. It can stand as their training ground. Similarly, for recreational players and those who do not have a huge bankroll, Bermuda Triangle can satisfy their slots cravings. They can actually capitalize on this game to increase their funds.